The schedule is slightly changed, according to further requirements of the teams. below you may find the schedule for the upcoming Jarun cup. This tournament will be the biggest so far, with 79 registered teams in all categories, coming from 14 countries. Thank you for becoming a part of our summer story. See you soon. Organizational board of Jarun cup is proud to present the first edition of the beach handball conference, that will be held during Jarun cup beach handball tournament. The goal of the conference is to spread the knowledge related to beach handball. In this first edition we are presenting the list of the lecturers that will speak about different aspects of the beach handball. 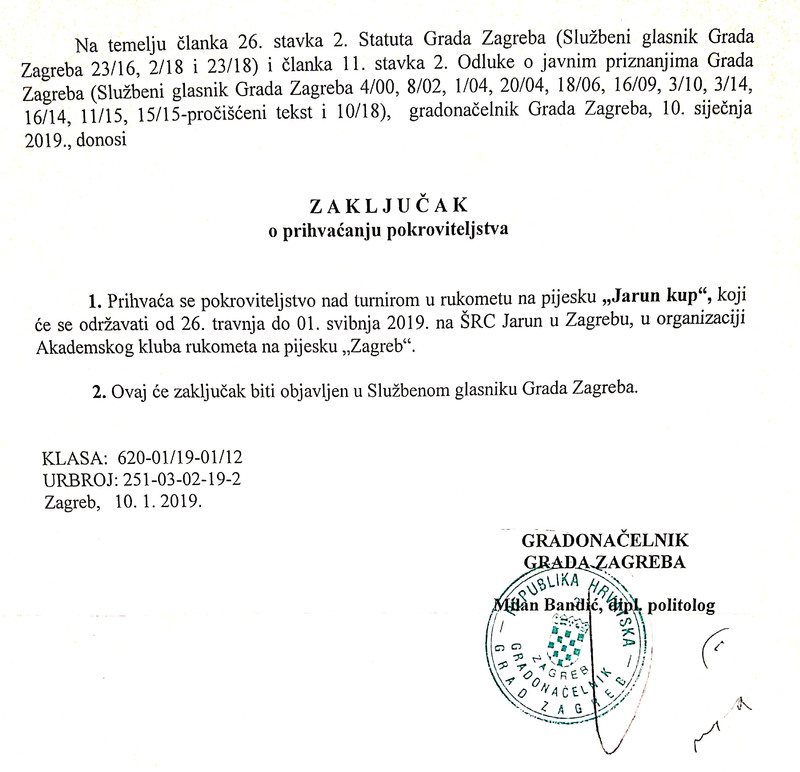 The conference will be held from 29.-30.4.2019. in Integrated hotel Zagreb and the lectures will be held at the evening, in order to avoid the overlap with the playing schedule. Beach handball experts such as Iva Kanjugovic, Dennis Heuvelmans, Sinisa Ostoic, Harald Mulder and Marco Bodmer will talk about different topics related with the role of marketing in this sport; different techniques of spreading the beach handball among youngsters, and about the requirements that were necessary in order to become a good beach handballer. Matija Rajnovic (Physiotherapist) will tell us few words about the prevention of injuries in beach handball and handball, while Karlo Prizmic (nutricionist) will point the main things related to the energetic demands required for beach handball players during competition. Psychologist Ana Znidarec Cuckovic will speak about the role of ifair play implementation among youngsters. Besides the sport competition, this conference will be additional value that makes this tournament unique. All interested persons are invited to come to hear the lectures. Participation is free of charge. Become a part of our Summer story and enjoy. See you on the sand. 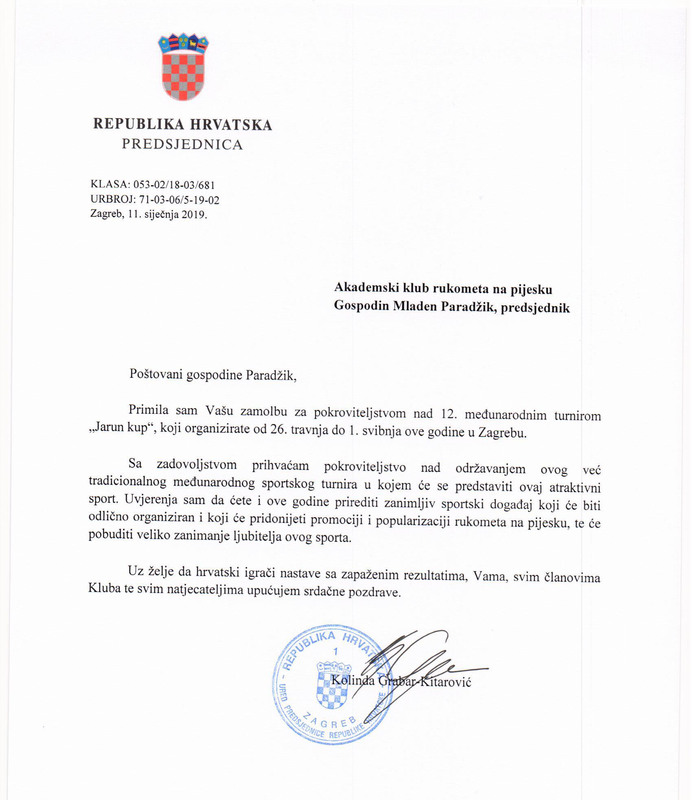 Dear beach handball friends, we would like to inform you that the President of Republic of Croatia, Kolinda Grabar-Kitarović, together with the Major of city of Zagreb, Milan Bandić, officially became a part of the biggest Croatian beach handball tournament, Jarun cup. Beside them, Jarun cup received the support from the other institutions, such as Central state office for sport, Croatian national tourist board and City office for education and sport, which will contribute to the quality of our project and sport in general. Last year tournament reached more than 700 participants (78 teams), and more than 220 games were played during 5 days. We hope that this support will enable us continuous growing in each segment of the organization. This board is really happy to have such great institutional support and we hope that we will continue to develop this young and attractive sport, especially in the moment when we expect that beach handball will become a part of an Olympic family in the near future. Our duty is to work together and try to reach this goal and be prepared for it. That is one of the main reasons why we organize Jarun cup so early all those years (prolongation of the outdoor beach season for the players, creation an opportunity to compete for youngsters in different categories etc. ),so we could say that this project has wider and specific role in the development of beach handball in general. That is the reason why I am really happy that above mentioned Institutions recognized our effort based on enthusiasm of volunteers, officials, players and Org. board as well. on behalf of the Organizing Committee (OC) of the Jarun cup, I would like to invite you to the twelfth edition of this beach handball tournament. Each year was better and last year we had 75 teams participated in all compettition categories from 13 European countries. 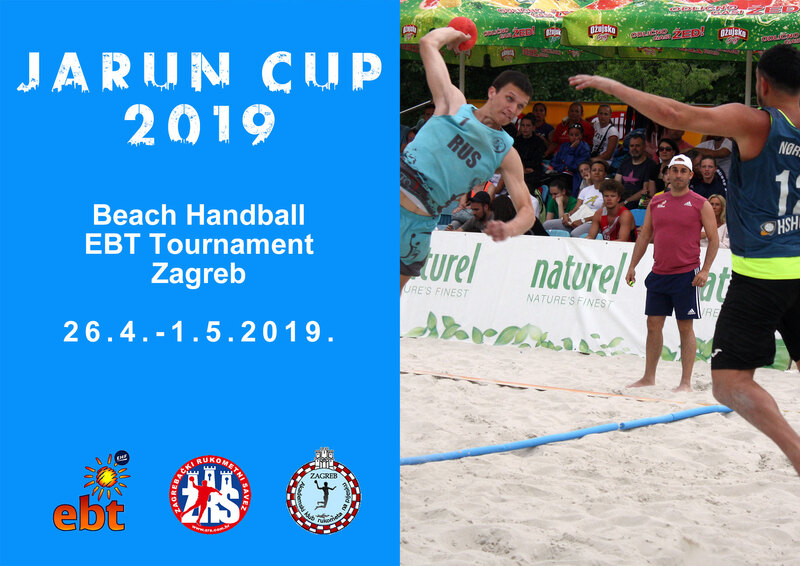 the twelfth edition of Jarun cup, the biggest Croatian beach handball tournament, which will be held from 26th of April until 1st of May 2019, is coming soon. We expect this beach handball tournament to be an extraordinary event, involving teams and official persons from many European nations. Numbers from the last year edition of the tournament (75 teams in all categories, 221 played games, around 650 participants from 13 European countries, 50 volunteers helping in the tournament organization) confirmed that Jarun cup beach handball tournament is constantly growing and and our goal is to improve it a little bit more every year.